Five things you didn’t know about me. I got tagged by Ken. Hmm. Let’s see. Five things? Who started this, anyways? Consider two sets. A is the set of all things that you, my loyal reader, don’t already know about me. B is the set of things that I am comfortable telling to the entire population of the Internet. A ∩ B is vanishingly small. But I’ll give it a shot. 2. I was, I believe, the youngest instructor ever hired by Asbury College – I started teaching College Algebra at Asbury when I was 22. 3. I used to play violin for the Tallahassee Junior Chamber Orchestra. 4. I won the Kenyan national secondary school poetry recitation contest in 1987, reciting “To An Old Lady, Asleep At A Poetry Reading”, by James Kirkup. My phony English accent was convincing enough that the judge was quite distraught to find out afterwards that I was American. 5. In 1983, I won the North Florida, South Georgia, Road Racing Grand Prix, which means that I won more first places in 5K road races than anyone else in the 13-and-under age group. Passing the baton, I think I’ll tag Ruth, Paul, Moose, Chris, and Tony. The airplane/treadmill problem seems to assume that the wheels provide thrust for a plane that is trying to take off. They don’t. The thrust is provided by the jets (or propellers) against the air, not against the runway. Spinning the wheels of an airplane doesn’t result in air flow over the wings. A plane becomes airborne due to the Bernoulli effect of airflow over the wings, not because of spinning wheels, or any other motion with respect to the ground. The arguments that I’ve seen offered about this so-called problem seem to completely lack understanding of how aerodynamic lift actually works. Because the jets exert thrust against the air, and not against the runway, the fact that the runway is a treadmill – assuming that could actually work – would be to hold the plane stationary in the air, and there would be no resulting airflow over the wings, and thus no resulting lift. The blowing of the jets (or propellers) would have all the resulting upwards lift of a box fan. Actually, the more I think about it, I’m not at all sure what assumptions folks are making. But they don’t involve any understanding of lift. If the wings don’t move relative to the air (or vice versa) there will be no lift. Sarah and I did some origami. That was lots of fun. But what I find even more fascinating is the bizarre random assortment of stuff in the background of these photos. These photos feel like my mind of late. Presumably something important in the foreground, but lots of strange and inexplicable things jockeying for attention just outside of focus. Federal Regulation D limits the number of preauthorized, automatic, telephone, electronic (including ACH), online and other transfers and withdrawals not made in person or at an ATM to six (6) per month for all savings accounts. Excessive activity will result in a Reg D violation fee for each applicable transfer/withdrawal over the monthly limit; please refer to your current pricing schedule for personal accounts. There is no limit to the number of transfers you can make from your checking account. So … the government says that if I make more than 6 deposits to my savings account in a month, I’ve committed a crime. A crime for which they can fine me. I have to assume that this made sense to someone. I hope that it’s about more than just artificially creating an additional source of revenue, but I honestly can’t see any reason why it would be a crime for me to transfer money to my savings account. I suspect that there are poorly defined reasons behind this, protected by the all powerful, but mostly illusory words “terrorism” and “national security”. Whatever the reason, it makes me angry. I used to read Alec Saunders religiously. It seems that his site moved to a new place quite some time ago, and I missed it. Interesting stuff there. Hi, Alec! 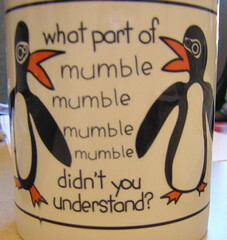 Mumble mumble cow-orkers mumble birthday mumble mumble. 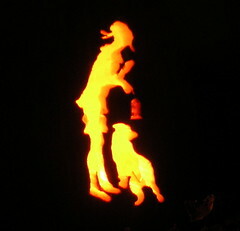 We carved some pumpkins this weekend. It took me 2 hours and 20 minutes to get from one gate to another at the Paris CDG airport. I do believe that airport is intentionally designed to frustrate the traveler. In addition to which, it was as though the “security” there was an intentional parody, with everything as inefficient as possible, and as inconvenient as possible, without actually being secure. There was a line down the jetway. I didn’t know what we were waiting for, but we waited a long time. Finally, at the bottom of the jetway, our boarding pass (for the flight we just left) and passport were checked by two entirely different varieties of police. One was the Frontier Police or something like that. One was the airport security folks – I guess their variety of the TSA. They weren’t talking to each other, and were checking exactly the same things. Then my boarding pass was checked as I entered the terminal. I’m not sure why. On arriving at Terminal 1 central (you have to look at a map of CDG to appreciate …) I tried to determine where to go next. There was a large map of the airport, with lists of what airline flew from what terminal. These lists weren’t alphabetical, they were per terminal. So to find out where to go for Delta, I had to look at each terminal, and read the list of airlines that flew from there. Some airlines flew from multiple terminals, in which case you also had to look at a list of destinations, like “Delta – USA” or “Delta – Europe”. I finally determined that I needed to go to 2E, and headed towards the place where I could get the bus to Terminal 2. There was a person in the hallway stopping everyone and checking tickets. I’m not sure what for, since she didn’t actually tell me if I was going in the right direction, and seemed quite annoyed when I asked. My ticket was then checked again when I got to the waiting room for the bus. I waited perhaps 20 minutes. The bus was clearly labeled “Terminal 1”. I asked if it was the bus to Terminal 2, and was assured that it was. They checked my ticket for good measure. On the bus was the driver and his assistant. They argued the entire time about what terminal they were going to, and what section of the terminal was next. “2A is next!” “No, 2D is next!” Delightful. At each stop, they checked everyone’s ticket as they got off to make sure that they were going to the right place, and argued over whether it was. Apparently this airport even confuses the folks who work there. So, I finally reached 2E. Did you look at the map I linked to? Notice that there’s no 2E? This should make you worry. Unfortunately, I didn’t have a map that noted this fact, so I got off at 2E. After entering 2E, there was a long line to go through security before getting to the boarding gates. After waiting in this line for a while, my ticket and passport were checked, and I was told that I couldn’t go through until I checked in and got a boarding pass. For this, I needed to go down that stairway over there. I went down and couldn’t find any Delta checkin desk. Finally noticed a Delta logo about –>this<-- big behind the Air France desk. Ok. So I went to check in. This was the one easy part of the process. Back upstairs, I got back in the line. When I reached the front of the line, I was sent to the back of the line right next to it. I'm not sure why, and the guy refused to tell me when I asked. Upon reaching the front of that line, I was sent back to the original line. I am not making this up. On reaching the front of *that* line, I was sent to yet another line, across on the other side of the security area, for which I had to cross past 6 other lines. My boarding pass and passport were checked. I had to do the shoes-off keys-out phone-in-the-basket shuffle and go through the security metal detecter thingy. My boarding pass and passport were checked. Now it's over, right? No! Not yet! I went down to gate 2-E-82, only to discover that, due to construction, there isn't a gate 2-E-82!!! You have to take another bus from gate 2-E-80 over to another building where you can find 2-E-81 through 2-E-87. By this time, the flight to Cincinnati was already boarding. The first bus was full, but I got on the second bus and took a 20 minute driver over to the temporary pseudo-terminal. There, the TSA-alikes checked my boarding pass and passport, and asked if I was carrying anything explosive or weapon-like. I assure you, buddy, if I were, I would have used it a LONG time before now!! Then, finally, my boarding pass and passport were checked by the Air France/Delta folks, and I was let on the plane. The time was 13:10. Oh, yeah, they checked my boarding pass at the door of the plane. You know, just in case nobody had done that yet. I found some places on teh intarweb that had roofs for around $300, and you put it on yourself. I’m not so sure I want to tackle something like that, but I’m also not sure I want to spend $1200 for a new roof. At that kind of cost, it might be more effective to trade it in for a newer Jeep. You folks should buy more of my books, so I can afford a new roof.